Term 3/4 School Holidays – NAO Workshops for Students! Swinburne University will be holding a NAO workshop for students over the Term 3/4 school holidays. 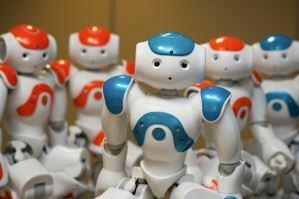 NAO robotics course is designed to introduce students to programming and enable them to work closely with these robots. Students will be introduced to motion and sonar sensors, voice recognition and sound and vision tracking through hands-on practical activities which will bring the NAO robots to life. NAO is a little character with a unique combination of hardware and software: it consists of sensors, motors and software driven by a dedicated operating system. NAO gets its magic from its programming and animation. The workshop will be run over 3 days (9-3pm) on the 4,5,6 October at Swinburne. These workshops will be available to students from Years 6 -Year 9 and will be limited to 10 students per workshop. The cost per workshop is $300.